The pains in making vadam is worth the gains. Though summer in other parts of the country starts after a month, Coimbatore will be hot by February. Generally during the month of February, Coimbatoreans start making vadaams and vathals, as there will be wind and dust on March. I too have started it. The photo is sun dried vadaam. This is to be fried in oil and added to vatha kozhambu or kootu which gives a special flavour to the dish. Karamani (Cow peas) - 1/2 kg. Brush the karamani with oil and sundry it. Pound it to half using a mixie . Discard the skin. 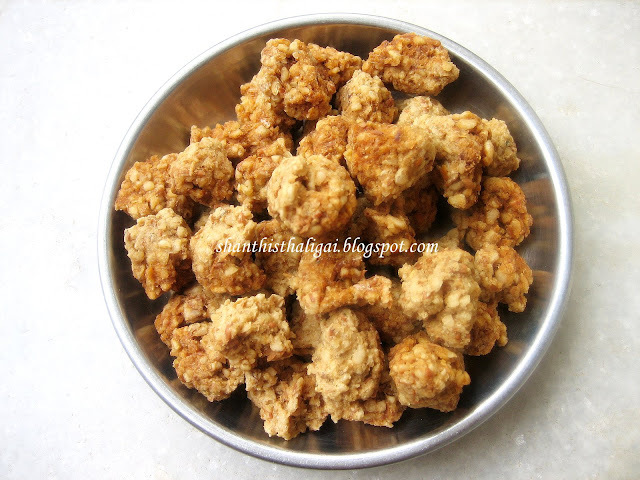 Soak in water just for 10 minutes, drain completely, add red chillies, salt, hing and curry leaves and grind it to a thick coarse paste ( like aama vadai batter). Spread a plastic sheet on the terrace, pinch out small balls from of the batter, place it on the sheet and sundry for 4 or 5 days. Store it in an airtight container. How to use it? Scroll down to see the kootu. Click here for kootu & here for vadaakozhambhu. It takes me back to my Grandma's time. Now my MIL makes and keep her daughters and daughter in laws fully supplied. Thanks for the recipe. Wow thanks for sharing this great recipe...had it long back with my friend Vidya who brings this vadaam often for her lunch.. Wonderful traditional wafers, I love it. thanks for posting. my mom and grandma used to make this in bulk and supply to my relatives.though i dont like the smeel of that,nowadays stared eating this.absolutely a traditional recipe and will be useful for all. wow :-) thats my favourite.. Will try it and comment back soon. Thanks for the recipe. Thanks for this tradition recipe, very useful for for people like us who never saw such recipes earlier. Kozhambu vadam is a new dish for me. Looks delicious and tempting. Thanks for this wonderful recipe. really felt nice to the recipe.I love all these vattals.we have so many types of these in Kerala.with the left out rice adding hing,chilli powder an dsalt we can make vattals after grinding them and keeping them in the sunlight to get them dried. after frying,they turn out to be very nice snacks. Shanthi,there is aspecial simplicity in your words.great! Aha, ippovae summer vantha mathiri irruku, seeing all the vadams. It looks so good, my mom used it make it too. Thanks for posting. Looks excellent - never made this or had this! But its too much work for me - wish i can walk over to your house and eat! Haven't heard of this vethal-going to try this. I thought they add poosani vethal to pulikottu. This one looks delightful Shanthiji...! Kuzhambu vadaam is my fav. My Mom keeps frying them and I keep eating them sneakily ;-). I have some in my pantry at the moment, but like Ro said, I can't even think of making vadaams here :-(. When I go to India, I'll be sure to pack enough of it though. Thanks.I love yr blog.Can I soak the karamani and then grind it? how to apply oil on dry karamani and then sun dry it..then soak..little confused..if possible..can u post the steps?Thanks a lot,. is this the same as karuvadaam ??? are u telling this in a different way ? or is that different ? Thank you for your visit and valuable comments. My ebook - "Pongal, Bhogi, Kanu - A complete festival cooking guide." Learning never ends. I am enthusiastic to learn things. Very outspoken and transparent. Though a career woman before,enjoying this phase of life, being a proud homemaker.